Soil water is an important composition of water recycle in the soil-plant-atmosphere continuum. However, intense water exchange between soil-plant and soil-atmosphere interfaces only occurs in a certain layer of the soil profile. For deep insight into water active layer (WAL, defined as the soil layer with a coefficient of variation in soil water content >10% in a given time domain) in the Loess Plateau of China, we measured soil water content (SWC) in the 0.0–5.0 m soil profile from 86 sampling sites along an approximately 860-km long south-north transect during the period 2013–2016. Moreover, a dataset contained four climatic factors (mean annual precipitation, mean annual evaporation, annual mean temperature and mean annual dryness index) and five local factors (altitude, slope gradient, land use, clay content and soil organic carbon) of each sampling site was obtained. In this study, three WAL indices (WALT (the thickness of WAL), WAL-CV (the mean coefficient of variation in SWC within WAL) and WALSWC (the mean SWC within WAL)) were used to evaluate the characteristics of WAL. The results showed that with increasing latitude, WAL-T and WAL-CV increased firstly and then decreased. WAL-SWC showed an opposite distribution pattern along the south-north transect compared with WAL-T and WAL-CV. Average WAL-T of the transect was 2.0 m, suggesting intense soil water exchange in the 0.0–2.0 m soil layer in the study area. Soil water exchange was deeper and more intense in the middle region than in the southern and northern regions, with the values of WAL-CV and WAL-T being 27.3% and 4.3 m in the middle region, respectively. Both climatic (10.1%) and local (4.9%) factors influenced the indices of WAL, with climatic factors having a more dominant effect. Compared with multiple linear regressions, pedotransfer functions (PTFs) from artificial neural network can better estimate the WAL indices. PTFs developed by artificial neural network respectively explained 86%, 81% and 64% of the total variations in WAL-T, WAL-SWC and WAL-CV. 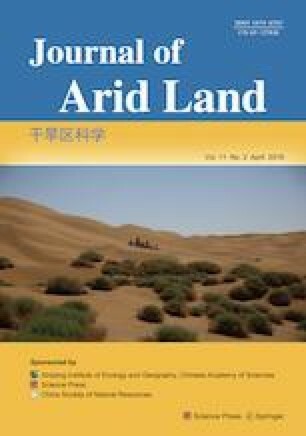 Knowledge of WAL is crucial for understanding the regional water budget and evaluating the stable soil water reserve, regional water characteristics and eco-hydrological processes in the Loess Plateau of China. This study was supported by the National Natural Science Foundation of China (41530854, 41571130081), the National Key Project for Research and Development (2016YFC0501605) and the Youth Innovation Promotion Association of Chinese Academy of Sciences (2017076). We thank the anonymous reviewers and editors for their valuable comments and suggestions for improving the manuscript.